Very nice room in a lovely building Walking own the main staircase felt quite grand. 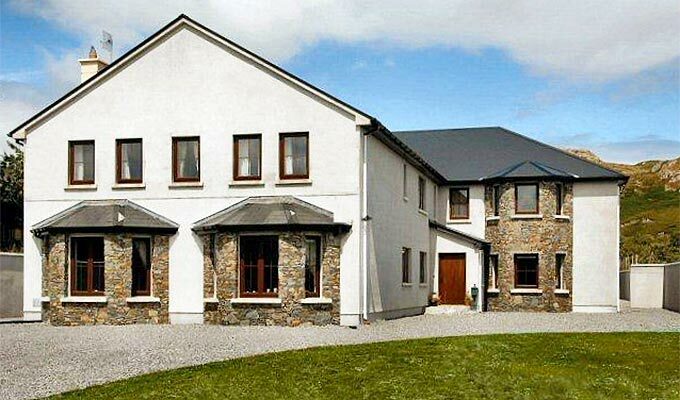 The location is excellent, an eay walk to the main area of Clifden. The hosts were nice and the cooked breakfast was very good. Nice location on the Atlantic Wild Way in Clifdon. Close to good dining and other amenities. All The Two's was the perfect accommodation choice for our three days around Clifden. Maureen and Brenden welcomed us warmly. Our rooms were beautifully appointed, spotless and very spacious. The beds were so comfortable. The bathrooms were also spotless and the toiletries plentiful. The breakfast service was fantastic. The morning staff were so very pleasant and the hot food choices were excellent. Pots and pots of tea and coffee were offered. The fruit salad, brown breads, and toasting bread selections were perfect. We took in Kylemore Abbey, the coast, Ashford Castle, Cong, Sky Road, Dogs Bay and so much more! Clifded has lovely shopping and lots of dining options - Foyles and Mitchell's are particularly nice - I suggest you make reservations. Once again, All The Two's is a standout accommodation choice! Thank you Maureen and Brenden! The best B&B we rented for several years. Very nice place, clean and tidy. Good breakfast. Within walking distance of town centre with lots of nice pubs. Beautiful surroundings in general, although the acuatal house is in the outskirs of town. Superb accommodation. Freshly cooked breakfast. Stunning house. Stayed this weekend. My third time here. Will be back next year. Would recommend to anyone. One of the best B&B's I have ever stayed in. Stayed here for 3rd time on Saturday night 28 May. As usual everything was brilliant. Large, clean and well appointed en suite bedroom. Delicious freshly cooked breakfast. Great hospitality. Best wishes to host Maureen for a quick return to full health. Will be back soon. Very good service and lovely breakfast here. We had a very nice stay at All the Twos. It had very spacious rooms and the breakfast was excellent. Maureen, the owner, was very nice and very helpfull. I would recommend this B&B to everyone. B&B vivement conseillé. Tout est parfait. Chambre spacieuse, accueil, Petit Dej Irlandais. Proximité centre Clifden. Lovely B&B. All the twos or "all is perfect". One of our best real Irish B&B during our visit in Ireland. Great place to stay and explore Connemara. The B&B was clean and quiet. Our room was cozy and the bed comfortable. Our breakfast was delicious. Very friendly host. Very nice rooms, excellent breakfast, fresh made. Super. Very friendly hosting and a big, well made room. Cosy big living room at the service of all guests. Wow ! This fabulous place is, by definition, a B&B. BUT, it is worthy of 5 star status. Everything about it is first class... the hosts Maureen and Brendan, the accommodation, the food.......I will definitely be booking All the Twos when I return to Clifden. This was the nicest B&B we stayed in on our tour of Ireland. We had a lovely, warm welcome, great breakfast, and a very comfortable room. We enjoyed the short walk into Clifden, and are looking forward to staying longer next time. Very nice modern B&B. Spacious clean rooms, and just a nice 10 minute stroll from the downtown. Would highly recommend. This B&B is perfect. The location just on the edge of Clifden was just right for a base when visiting such a beautiful area for a short time. The room had a great mountain view to rear. The cleanliness and comfort of the room could not be faulted, best bed I've slept in since my own. The food was excellently prepared by great staff and lovely hostess. Comfort was the byword, with a lift for those in need. The room was large and comfortable. Breakfast was good. The only negative was that there was a large spotlight that came on in the front of our room. It was lucky that the room was fitted with excellent drapes. My family and a French family stayed in All The Two's for one night in May. The accommodation and breakfast was fantastic. Great, well equipped, warm and comfortable bedrooms, much better than you would get in Irish hotels. A great choice of freshly cooked food was on offer for breakfast. And then there was the great welcome from our host. Nothing was too much bother for her. A great location for any visitor wishing to explore the many delights of Connemara. Simply great. We will be back! My friends and I stayed for three nights in July 2014 and were extremely impressed by everything -- it was comfortable and spotless and quiet, just a very short walk into town, and breakfast was excellent. Beds and pillows were comfortable, rooms were spacious, hot water was strong and plentiful in the bathrooms. I really appreciated the light-blocking curtains on bright Irish summer nights! Maureen was a wonderful hostess. We would not hesitate to stay again and recommend it to anyone. Fantastic place, perfectly positioned, great breakfasts and a fabulous host. Can't fault it! A lovely two day stay. Spacious, modern room and en-suite, excellent breakfast menu all topped by the personal attention received from Maureen and her staff. Highly recommended. Very nice place to be. All the service was perfect. Very comfortable. Maureen the innkeeper is perfect. We needed a place to stay for one two nights while in town on work. Maureen's guesthouse is the most wonderful place, modern, warm and welcoming. Maureen went to every effort to make us feel at home and welcomed. Even making us a grand cup off tea after a long evenings work. Couldnt recommend this place enough! .. oh and the view.. Out of this world!! Very good - modern, clean friendly with great facilities and close to town centre. Recommend! This guesthouse couldn't have been better for our short break in Clifden. A lovely welcome, a large room at the front of the house and a hearty breakfast, freshly made to order. The decor throughout is clean and fresh and there is a comfortable, good sized room downstairs to relax in. The guest house is within about 15 mins walking distance of the restaurants in Clifden along a well lit path.